Giovanni Battista Parodi (1674–1730) was an Italian painter, born in Genoa. He belonged to an Italian family of artists. His father was the sculptor and wood-carver Filippo Parodi (1630–1702). His brother was Domenico Parodi (1672–1742), a painter, sculptor and architect. Filippo Parodi was an Italian sculptor of the Baroque period, "Genoa's first and greatest native Baroque sculptor". In Genoa his frescoes are to be seen in the Church of Santa Maria Maddalena.  } But he spent most of career in Milan and Bergamo. He added church ceilings in Milan, contributed to the decoration of churches in Bergamo and to the Palazzo Mazzoleni in Bibbiena. In Rome, his sole prominent public commission was for the fresco of the ceiling of San Pietro in Vincoli in 1706.  and the vault medallions (c. 1706) in S Maria dell’Orto, Rome. Bergamo is a city in the alpine Lombardy region of northern Italy, approximately 40 km (25 mi) northeast of Milan, and about 30 km (19 mi) from Switzerland, the alpine lakes Como and Iseo and 70 km (43 mi) from Garda and Maggiore. The Bergamo Alps begin immediately north of the city. Bibbiena is a town and comune in the province of Arezzo, Tuscany (Italy), the largest town in the valley of Casentino. It is located 60 kilometres (37 mi) from Florence, 30 kilometres (19 mi) from Arezzo, 60 kilometres (37 mi) from Siena, and 20 kilometres (12 mi) from the Sanctuary of La Verna. Giovanni Battista Tiepolo, also known as Gianbattista or Giambattista Tiepolo, was an Italian painter and printmaker from the Republic of Venice who painted in the "Rococo" style. He was prolific, and worked not only in Italy, but also in Germany and Spain. Giovanni Battista Gaulli, also known as Baciccio or Baciccia, was an Italian artist working in the High Baroque and early Rococo periods. He is best known for his grand illusionistic vault frescos in the Church of the Gesù in Rome, Italy. His work was influenced by Gian Lorenzo Bernini. Giuseppe Maria Crespi, nicknamed Lo Spagnuolo, was an Italian late Baroque painter of the Bolognese School. His eclectic output includes religious paintings and portraits, but he is now most famous for his genre paintings. Ciro Ferri was an Italian Baroque sculptor and painter, the chief pupil and successor of Pietro da Cortona. Giovanni Battista Castello was an Italian historical painter. Sebastiano Ricci was an Italian painter of the late Baroque school of Venice. About the same age as Piazzetta, and an elder contemporary of Tiepolo, he represents a late version of the vigorous and luminous Cortonesque style of grand manner fresco painting. Domenico Maria Canuti was an Italian painter of the Baroque period, active mainly in Bologna and Rome. He was a major painter of fresco decorations. His ceiling decorations showed a mix of Bolognese and Roman influences. Giovanni Battista Carlone (1603–1684) was an Italian painter of the Baroque period, active mainly in Genoa. Domenico Piola was a Genoese painter of the Baroque period. He was the leading artist in Genoa in the second half of the 17th century, working on ceiling frescoes for many Genoese churches and palaces and canvas paintings for private collectors. His family studio was highly prolific and frequently collaborated with other artists. Giacinto Brandi was an Italian painter of the Baroque era, active mainly in Rome and Naples. Events from the year 1706 in art. Events from the year 1668 in art. The year 1530 in art involved some significant events and new works. Aurelio Lomi was an Italian painter of the late-Renaissance and early-Baroque periods, active mainly in his native town of Pisa, Tuscany. Lorenzo De Ferrari was an Italian painter of the Baroque period, active mainly in his native city of Genoa. Giovanni Maria delle Piane was an aristocratic Genovese who served as primary court painter for over 60 years in the late-Baroque period. He is also known as "il Molinaretto". Giovanni Bernardo Carlone (1590–1630) was an Italian painter of the late-Mannerist and early-Baroque periods. 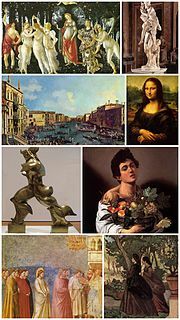 Italian Baroque art is a term that is used here to refer to Italian painting and sculpture in the Baroque manner executed over a period that extended from the late sixteenth to the mid eighteenth centuries. San Filippo Neri is a Baroque church on via Lomellini in central Genoa. The order of the Oratory of Saint Philip Neri had arrived in Genoa in 1643, under the sponsorship of the Oratorian and Marchese Camillo Pallavicini who was born in Genoa. Originally housed in the church of San Pancrazio, by 1674 the order began a move to this new site and built their church and chapter house on the site of a former palace of the Lomellino family. ↑ "PARODI, Giovanni Battista." Benezit Dictionary of Artists. Oxford Art Online. Oxford University Press. Web. 3 Nov. 2016>. ↑ "Church of St Peter in Chains". Europe-Cities.